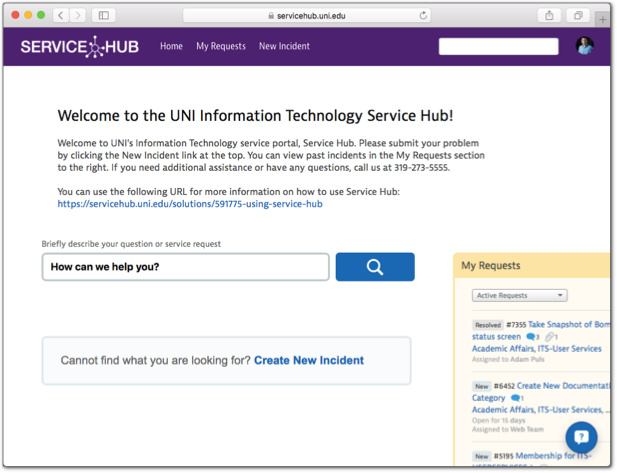 Service Hub is UNI's new information technology self-service portal for students, faculty, and staff to report technology incidents, for help, find solutions to common problems, and check on the status of past and current help requests (incidents). The guide that follows will walk you through the web portal and how to use the various features. 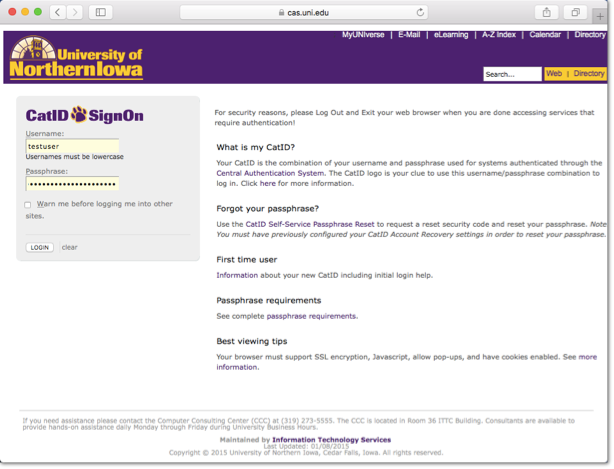 There are several ways to access the Service Hub portal, the most direct is to simply type servicehub.uni.edu into your web browser's address bar. You can also find a link for it in the Technology Resources portlet of MyUNIverse, or from the front page of the Information Technology Services (ITS) website. Once you have followed one of these routes, you will arrive at the familiar CatID login screen. Type in your CatID user name and passphrase and click Login. The search box in the middle of the portal allows you to type in a question. 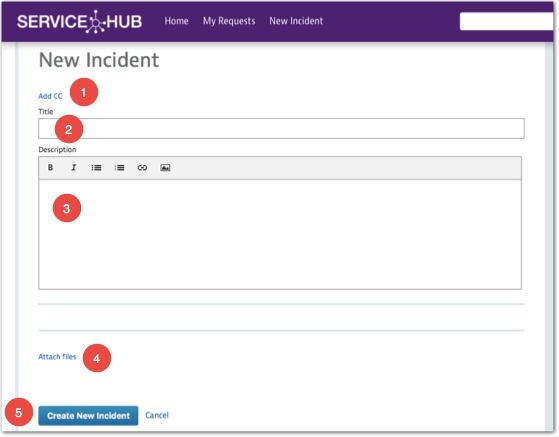 When you hit enter or click on the search button, Service Hub will search your past incidents and the online knowledge base (called Solutions) in an attempt to answer your question. This is handy if you have previously worked with someone to solve a problem that you were having, you can find the answer again quickly. If your search does not turn up the answer you are looking for, then it is simple and fast to submit a new incident, or help ticket. Click on New Incident in the menu at the top of the web page. You'll be taken to the create a new incident form. This form is simple, there are only two required fields. It looks much like creating a new email message. Add CC this option is in case you'd like to let someone else know about the incident that you are submitting. Once you've clicked the link, you'll have the opportunity to enter a number of email addresses. 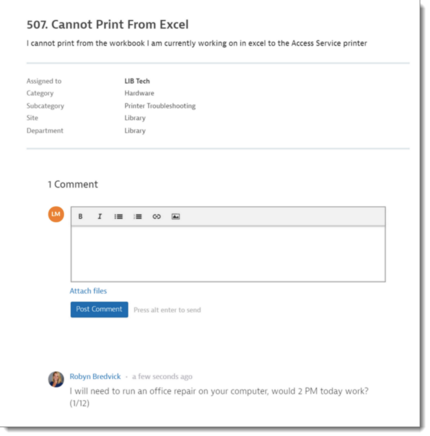 Title - give a descriptive title so that the problem can be easily identified (example: "Cannot print from Excel"). Description - The more detail you can provide, the faster tech support can address the issue (examples: computer name, webpage URL, steps you’ve already taken, error messages, etc.). Attach Files - You can include multiple files (up to 10MB each) to help explain your issue or problem. Screenshots of error messages are especially helpful. Create New Incident - Submits the incident to the processing queue. Your technical support will be notified via email that a new incident is waiting. You will receive an email notification containing the details of the incident you just submitted. Cancel will discard the current incident. To check on the status of previous requests that you've submitted or have had submitted on your behalf, click on the My Requests link at the top of the page. Once on the My Requests page, you'll see a list of your previous requests, if you have any, in a spreadsheet-like format. From here, you'll be able to see details about each request that you've submitted. You can click on the title of any request to be taken to a screen with more details. Incident Number - this is your incident number. Although it isn't necessary for you to remember this, they exist as unique identifiers for each incident created in the system. State - The state (status) of your incident (request). This might say any one of a number of different statuses that can tell you where work on your request currently is. See the following page for more information on the different statuses in Service Hub. Title - the title of the incident. By clicking here you'll be taken to a screen with more information and a place for you to enter comments for your technical support to see. Notice the little blue chat bubble with the numeral 1 by it. This indicates that there is one comment associated with this request. Assigned To - This lets you know to whom (or to which group) your incident is current assigned. If the field is blank, it is currently unassigned and will be routed for service soon by the IT Service Desk. If you click on the title of an incident in your list, you'll be taken to a screen with more information. You'll see current information about the request as well as a box to enter comments or provide more information. Below that you'll also see any comments or information that your technical support has posted to the incident. You can also attach more files if necessary or requested to do so.